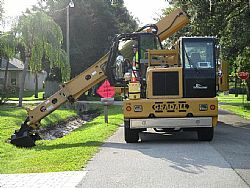 Sarasota County’s Stormwater Division crews are now taking a comprehensive, systematic approach consistent with industry standards in performing preventative maintenance. This approach is a departure from past practices of a reactive, complaint-driven process after a problem has occurred. This approach is identified as a Best Management Practice (BMP) for stormwater system maintenance. This approach enhances customer satisfaction, lowers long-term expenses and improves the drainage system’s overall performance. The basic premise of the BMP is: Start preventative flood system maintenance at the downstream end of a system; clean and make functional the smallest constrictions in the conveyance system to improve and maintain consistent flows, typically driveway pipes; combine work efforts with any requests for service where the service is warranted, thus reducing crew travel time and mobilization costs; do any additional aesthetic improvements after the primary objectives are completed.